This building is a 'town barn' in Port Washington WI. The building is owned by Mark Z. Our report will suggest historical observations, as well as materials and technique for its renovation. Photos and tour were done at his invitation on May 21, 2000. The owner was primarily concerned about the roof and settling vertical posts. The neighborhood appears to be "historically aware" with numerous older buildings (primarily homes) in excellent condition. 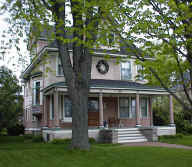 The house is currently on the National Register. 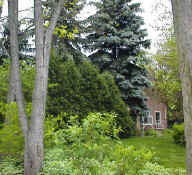 The house faces the main street, and the barn is located at the rear of a town lot, with a short sloped driveway to a side street. The building is attractive and is/can be highly functional as a vehicle and yard equipment garage, large shop, and offers significant storage on the second floor. 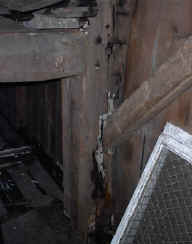 The building is of hand hewn post and beam constructions and is basically in good structural condition. Walls and roofline are straight, windows are in above average condition. The concrete floor and footings (other than at the vertical posts as noted below) as well as exterior paint are all in above average condition. This building was originally used for a different purpose and was most likely moved to this site in the early 1900's. The lower level's ceiling was raised approximately two feet higher than originally constructed. In perhaps the 1940's the lower sill was replaced with concrete and a nailer installed for siding. All structural problems are due to moisture, either through the heavily damaged roof, or from ground contact. The north roof is severely deteriorated allowing rain to accumulate on the second level floor and the top plate, both of which have rotted. The roof should be reconstructed as soon as possible or further decay will proceed very rapidly. Our suggestion is to replace the north top plate in its entirety with a similar hand hewn timber (9"x8"). 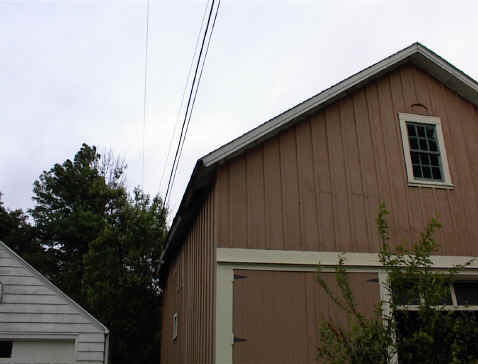 This can be done by removing all roofing, and removing nails holding the gable siding to the end rafters. Then the rafters spikes can be removed, the rafters lifted and braced 12" above the plate as the new one is lifted in. Rafters to be re-attached to plate as originally done, with heavy spikes or pole barn nails. The east/center post has softened slightly and cracked vertically almost a 4ft length. We believe this can be resolved with thru bolts and heavy washers to pull it back together, currently the split is starting to allow the plate to roll out, taking the 8" tenon with it. A consolidant will likely need to be used in any rotted area. At least two rafters and at least 50% of the roof boards need to be replaced. Replacement rafters to be ~6" round (sawn on top edge) pine or tamarack, trimmed to fit 4" cutouts at the plate. Every other rafter to have cross ties installed or repaired to each other two feet down from the peak. Both north and south roofs will need all new roofing material installed. The floor boards of the second level have suffered from the moisture, perhaps 250 square feet needing replacement. The floor boards and roof boards could be from the same 1" rough sawn pine, with floor boards being routed for tongue and groove joints. From below, the joists and first floor girders appear to be solid even though damp, final review with flooring removed will be required. If the floor boards are replaced as a first step then we could set up scaffolding inside on that floor, and remove and replace the roof boards from a safe stand inside. The new roof boards could be cut on the second floor and installed from the scaffold decking. Nails and fasteners to be "modern". Lumber and timber to be hand hewn, or rough sawn and other than bright color (which would fade in a few years) and would not appear as "repairs" to a casual observer on the interior. By lifting the rafters but leaving them more or less in place, a plastic tarp can be installed over them to protect the building from rain. They could also be the lifting points for bringing up the new plate. A subcontractor should be used for the shingle roofing and to install new gutter and downspout on the north side. The south side gutter should be reusable. All painting would be done by the owner. The owner is at risk of water damage when the roof is exposed, and should be encouraged to remove anything which might be damaged by leaking rain or storms. Bottoms of vertical posts are rotted off due to ground contact, there are not any footings under the posts. The north wall has dropped several inches because of it. We will need to do an exploratory dig to check the depth of existing footings under the walls. If they are frost-proof then the new post footings need to be, if they float on frost, then new will be the same. The "dig" was performed June 11, and showed the foundation to extend to at least 18" below grade poured up to and around the base of the vertical post which had gone perhaps 12" below grade, see picture. 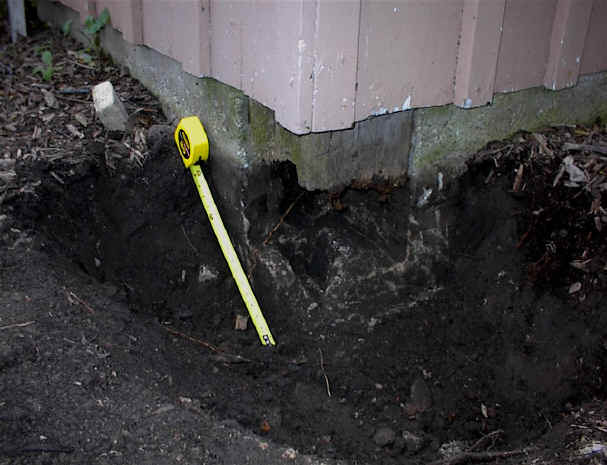 By cutting off the post approximately even with the bottom of the siding, and filling in the space in the foundation with concrete and a strap anchor to lock in the position of the post, the rot and sagging can be alleviated. Our suggestion is cut off any bottom siding nails, then to lift any sagging posts based on transit readings, and replace the nailers with pressure treated 2x4 (bolted to the foundation as now). I don't believe there is any reason to tie the foundation together with rebar through the current openings as the footing pad is not cracking nor indicating any current failure. There is no tie between the top plates nor the ceiling cross members, leading towards future problems of slow spreading or failure under snow loads. Will need to install a pair of 5/16" cables with 1/2" eye bolts thru wall plates, between the second level floor joists. To do so we would suggest removal of the siding board over the post, routing a recess for a 3/8" x 6" x 6" plate and nut. The proximity of the siding to ground level requires changes to allow proper function of gutters and downspouts that lead water away from the building. Splashing on north side (no gutter) is starting to cause siding damage, and pooling of runoff on south east corner will start to cause problems with foundation. This should be corrected by installing either tile drains leading to the storm sewer, or by changing the grade pitch and adding horizontal outlets to carry water away from the building. The moisture allowed into the structure so far will cause insect and fungus problems the next few years until dried out completely. To protect from both it is suggested to use Penetreat and a fungi protectant on all exposed surfaces as soon as the roof is back in place. The missing window sash on the north wall should be replaced. The same with two missing panes in the sash high in the gable on the east end of the building. The owner will need to provide for disposal of boards, timber, and shingles. The new plate could be lifted in with block and tackle, but a small crane or boom truck would do a nice, quick, and safe job of lifting in the new plate. Access from the neighbors concrete adjacent to the barn will be helpful. I believe the power lines are far enough from the building so they won't be an issue, if they are, the block and tackle route may be required. Further review and picture to left from June 11 shows the power lines to be approximately 15'above the plate, but phone lines are level with to 12" below the north gutter and only perhaps 2' horizontally from the gutter. This is a project suitable for Chris Kuehnel and an assistant. When the owner provides a bit more background on how he wishes to structure the contracting, and how all-inclusive he would like the services to be, we can prepare a proposal and contract, and complete the job in July, 2000. On June 11, the owner said he could arrange for the roofing and gutter work with another contractor, and that he would prefer us to quote on a time and materials basis. We should estimate costs for the major aspects of the job so that he can obtain funding and pre-approval from Wisconsin State Historical for rehabilitation tax credits. Northwest roof detail showing soft rafter with 'scab' boards added, and top plate which is just about rotted thru, patch has become non-functional. The stairs are damp but appear to be solid at the time of inspection. Under repeated soaking this will rot fairly quickly. Tree stump on north side will interfere with new post footing and needs to be removed. Note siding damage from moisture of splashing accelerated by former tree moisture. Tin flashing to be installed behing marginal siding to keep moisture away from new nailer. Vertical posts behind flashlight shows rot from ground contact, installing concrete posts under them will be straightforward due to shallow excavation requirement in spite of access challenges. A beautiful setting for barn and house.